Ben Chasny has a restless musical spirit, but one that utterly possesses whatever project he sets his mind to, from Rangda to Comets On Fire, Coypu and his work with the likes of Current 93. 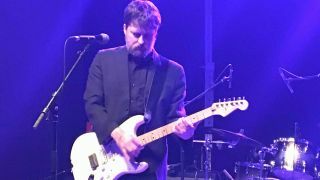 Away from his electric work, Six Organs Of Admittance is the man's primary outlet, ably channeling the intricate fingerpicking of British folk legends such as Bert Jansch and Nick Drake. 1. What was your first guitar and when did you get it? 2. The building’s burning down – what one guitar do you save? 3. What's the one effects pedal you couldn't do without? 4. Is there a guitar, or piece of gear, that you regret letting go? 5. When did you last practice and what did you play? “Just this morning I was trying to get down a Pierre Bensusan run. Maybe that is more learning a song, but I was trying to drill it into my head, so I will count it as practice. “I think we're living in an incredible time for resources for guitarists, especially with YouTube. Some of my favourites are those '80s shredder VHS tapes that people have put up, especially Marty Friedman and Paul Gilbert. I'm nowhere near any sort of shredder, but you can really pick up little moves and adjust them to your own style, such as Paul's technique of jumping octaves to create arpeggios. 6. Is there an aspect of guitar playing that you'd like to be better at? 7. If you could have a guitar lesson from one guitarist, dead or alive, who would it be? 8. What item of gear would you take with you to a desert island? 9. What’s the worst thing that’s ever happened to you onstage? “One time I was bringing a glass of wine with my right hand to my mouth, but it hit the microphone instead and spilled into my electronics on my acoustic. I wasn't even drunk. It was my first sip! 10. What advice would you give your younger self about playing the guitar?